When you click the X on a Play game tab, it means you want to abandon the game. You will then see the Abandon current game dialog above. If you choose the Keep playing button you can resume playing the current game as if the X was not clicked. 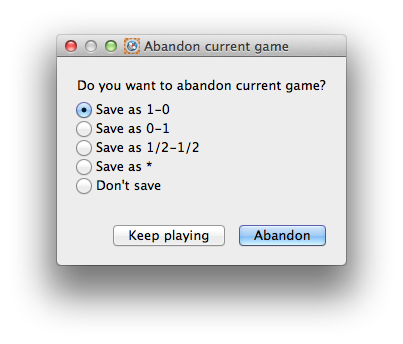 Choose the appropriate game outcome/action and click the Abandon button to abandon the game.